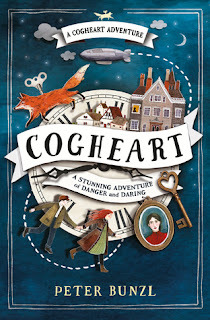 If you are in the mood for a late Victorian steampunk adventure (of the escape the bad guys sort) suitable for younger middle grade kids (8-9 year olds) but a pleasant read for grown-ups too, and like mechanical foxes, pick up Cogheart, by Peter Bunzl (Jolly Fox, Feb 12, 2019). This has been on my Goodreads tbr list since it was first published over in the UK in 2016, and it was great to get the chance to read it now that it's being published here in the US! (yes I know I could have gotten it through the Book Depository, but that way lies shopping madness....). Lily's life at a regimented finishing school is unpleasant. But when her father's housekeeper comes to fetch her away, things to not improve. For one thing, tragedy has struck- her father is presumed to have died when his airship crashed. For another, the housekeeper has taken over the house, tearing it apart in a mysterious search, all the money is (apparently) gone, and orphaned Lily (her mother died several years previously) has no one to care for her, except, perhaps, her godfather (though he is too old and sickly to take her in). Meanwhile, the mechanical fox belonging to Lily's father survived the crash, and desperately tries to reach her to deliver a message. But the fox is pursued by two murderous thugs (one of them truly creepy, with glass discs for eyes), and badly wounded by a gunshot, it barely makes it to a safe hiding place in the shed of the village clockmaker. The clockmaker's son, Robert, finds the fox, who tells him to go get Lily. Once the chase is on, about a quarter of the way into the book, it's an exciting and vivid adventure. It had a steampunk Joan Aiken feel to it for me (the evil housekeeper reminded me vividly of The Wolves of Whillouhby Chase), and the mad dash through the skies and wide range of mechanicals was the sort of odd adventure she might have written if steampunk had occurred to her. (I hope this is useful; if it is not useful because you have not read Joan Aiken, you should read Joan Aiken). The two kids, Lucy and Robert, both were given the chance to have their characters made clear to the reader before life and death made character development mostly a matter of being brave (which was a greater leap for Robert than for Lily; his self-doubt and personal fears were greater, and it was satisfying seeing him over come them). I liked them both, Lily for wanting to read forbidden adventures at school, and for appreciating that the mechanical constructs had genuine feelings and personalities, and Robert for being stalwart and endearing. So all in all, a satisfying story! Not exactly to my personal taste, because desperate flights from murderous thugs are not my cup of tea, but I enjoyed it nonetheless because of all the interesting details. Hahahahahaha! "but that way lies shopping madness." I understand that. I am hearing a lot about this book. I think I will have to check it out. I do love the cover! It's gorgeous, isn't it. I think it's going to be a great year for mg book covers!